Elbow replacement involves surgically replacing bones that make up the elbow joint with artificial elbow joint parts (prosthetic components). 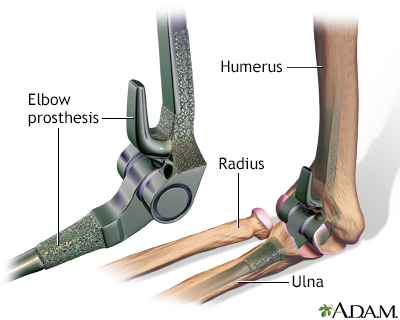 The artificial joint consists of two stems made of high-quality metal. They are joined together with a metal and plastic hinge that allows the artificial elbow joint to bend. The artificial joints come in different sizes to fit the patient.